My motto for the secret to happiness, generally speaking, is to like what I do rather than do what I like. Sure, this is easier said than done. Nevertheless, recalling this motto daily helps prevent my expectations from dictating my life willy-nilly. No doubt, scripture (Buddhist, Hindu, Taoist, Biblical, etc.) first got me seeing life along this line, and life experience has since verified its truth. Sheena’s TED talk spoke to this somewhat, and best of all, she had research to support it. Dan Gilbert: The surprising science of happiness is another interesting TED talk that continues to expose the erroneous assumptions we make. 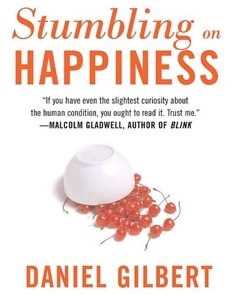 He attributes happiness as something we cognitively create — synthetic happiness as he calls it. 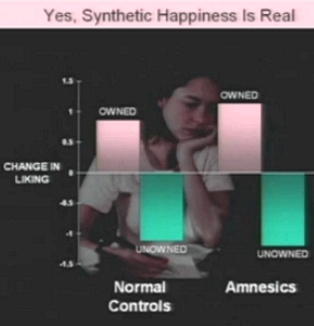 The only issue I have with him is his definition of synthetic happiness. According to Dan Gilbert – “Natural happiness is what we get when we get what we wanted, and synthetic happiness is what we make when we don’t get what we wanted”. Frankly, this runs counter to the Taoist or Buddhist point of view, as I experience it. His conclusion sounds reasonable only if you believe in free will, so I assume he believes in free will(1). He also doesn’t see how the human situation is truly natural, an emergent property of primal instinct. It is just that our particular evolutionary gift of cognition often becomes problematic because we ‘think we know’. Chapter 71 points out how we pay for this gift of cognition, Realizing I don’t know is better; not knowing this knowing is disease. Indeed, doesn’t every benefit come with a cost? This is simply natural balance. Therefore, by definition, I’d say animals have natural happiness precisely because they don’t have this cognitive ‘simulator’. Realizing this ‘simulator’ causes our disease, as the rest of chapter 71 points out, helps mediate its effects upon us. Therefore, if anything, the very notion of choice — free will — interferes with truly natural happiness. We can’t be spontaneous to live out each moment because we always have a plan for later. Believing we have free will just locks the mind into our plan. They say wealth doesn’t bring happiness. I would say paradoxically that happiness is wealth. Correlations could easily sort this inconsistency out, but perhaps it is obvious enough already. The ‘active’ wealth we seek is material and promises happiness in the illusion of ‘more is better’ and ‘the grass is greener’ pots of gold at the end of our thought’s rainbow. Humanity’s wealth of technology comes under that category. The ‘passive’ wealth that we receive in contentment correlates with true happiness. As chapter 33 puts it, Being content is wealth. It is ironic that the happiness we seek is potentially right under our noses, but being unable to feel, we are prodded to search ‘out there’ for it. Of course, this is just another one of nature’s hoodwinks to keep life living. We are always Imagining a Better Way. (1) Something like this happened a few years ago during our home schooling days. My sons and I were studying Biology and Human Behavior: The Neurological Origins of Individuality, taught by Professor Robert Sapolsky. It was a solid biological nail in the coffin of free will. Yet, to our utter amazement, Professor Sapolsky concludes his lectures with an emotional appeal smacking of free choice! This just goes to show the holding power of a cultural paradigm. If you believe in free will, in God, or in ghosts, nothing can dissuade you. Belief IS the blind spot. I suppose I should address an obvious follow-up question: Do I believe there is no free will? No, I just fail to see any proof. The belief in free will, whether implied or explicit, seems more likely to be a symptom of a number of deep-seated emotions. In other words, our belief in free will is simply an emergent property of deep-seated emotions acting upon cognition’s imaginations. To be fair, perhaps I misread the Professor. After all, I was limited to a DVD’s one-sided conversation. In any case, his research is solid and worth serious study.